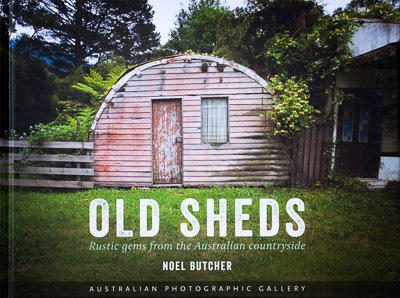 Collected over more than a decade by a photographer driven by a secret passion, the sheds in this book are a reminder of the ingenuity and resourcefulness of our farmers of yesteryear. Most are unique in their design and all show signs of age as they slowly decay and return to the earth. Some of these sheds no longer exist, living on only through photography. This is a book for lovers of photography, architecture, the Australian heritage, and old sheds. Old Sheds is possibly still available. Search online if you are interested. Retailing for about $24.95 Old Sheds will make a great Christmas present or gift for a bloke at any time of the year. This site is being downgraded to what is really just a link which is why it is currently lacking in pretty much everything. If I get around to it, Old Sheds images will be available on my main site, here.